A magnet is a object that produces a magnetic field. This magnetic field is invisible and is accountable for the way it attracts or repels other ferromagnetic materials, such as iron and other magnets. 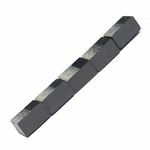 In this section we offer ceramic, ferrite and rubber magnets that you can use for reed relays, refrigerator magnets and tools etc. 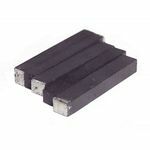 Rectangular ferrite magnet. 1-1/4"L X 3/16" W X 1/8" H Five per package. North marked by white paint. NOTE: Does not work with our reed switches.